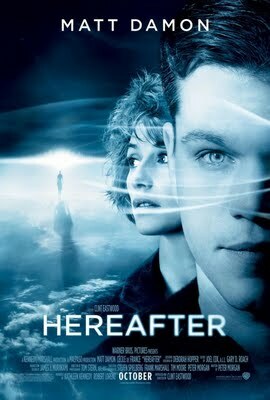 I didn’t know anything about Hereafter going into it other than that Matt Damon starred in it, Clint Eastwood directed it and it had something to do with the afterlife. In this case, I think going in fresh took away from the movie. This is mainly because I had no idea that the movie is about three separate characters’ stories, characters each living in separate countries, which gives them little opportunity to interact. Despite an exciting opening scene, Hereafter quickly moves to a much slower pace. I think this hurt my enjoyment of the movie while watching it, because I kept wondering when George (played by Matt Damon), Marie (played by very accurately named Cecile de France) and Marcus (played by Frankie and/or George McLaren) were going to somehow interact with each other. It wasn’t until I accepted to just enjoy each storyline for itself that I really started getting into Hereafter. Out of the three stories, I found Marie’s to be the most compelling. After a near-death experience, she experiences some kind of glimpse at an afterlife. Her attempts at convincing people of what she saw go about as well as one of your coworkers trying to convince your office of what she saw in her near death experience. Her character goes through the most dramatic changes, which is why I kept wanting Eastwood to go back to her story when he was focusing on George or Marcus. Demetri Martin explains what you really see during near-death experiences. If you believe that John Edward really has powers to communicate with the beyond, then Hereafter will probably be the movie for you, as it will largely confirm your beliefs. Not to say that the movie endorses Mr. Edward and his like in any way. Hereafter spends a fair amount of time warning believers that the majority of people claiming to have abilities to talk with the dead are delusional at best and scam artists out to take your money at worst. South Park’s depiction of John Edward isn’t all too different from the portrayal of a similar psychic in Hereafter. I enjoyed Hereafter enough. I gave it three stars on Netflix. It’s an interesting movie, but not one I’d go out of my way to recommend to people, unless the subject matter really appeals to them.